The daguerreotype Saxton took of Philadelphia’s first Central High School and the State Armory is perhaps the earliest daguerreotype ever taken in the United States, and certainly represents the oldest American daguerreotype extant. It is now in the custody of the Historical Society of Pennsylvania in Philadelphia. "Following a detailed description of the process published by Professor J.F. Frazer in the Journal of the Franklin Institute, Philadelphia, for October 1839, or possibly one that had already appeared in the United States Gazette published in Philadelphia on 25 September, Joseph Saxton an employee of the United States Mint, took the first daguerreotype in Philadelphia on 16 October. 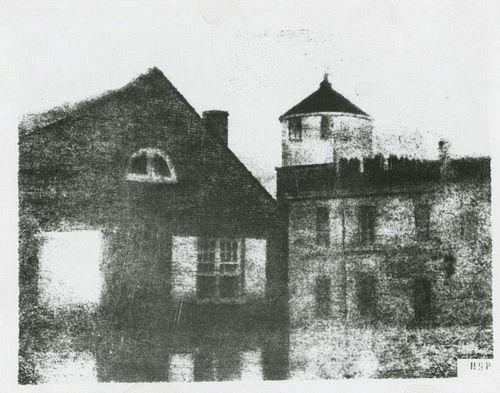 The picture measures 1 1/8 inches x 1 1/2 inches and showing the old arsenal and the cupola of the Philadelphia Central High School, was taken from a window of the Mint. It is the earliest surviving American daguerreotype and is preserved at the Historical Society of Pennsylvania. Though by no means perfect, even allowing for blemishes and dust which may have accumulated on it later, this first attempt was nevertheless 'sufficiently successful to demonstrate the beauty of the art when perfected; and we add that the success also shows the art to be quite susceptible of great and important improvements.'" Gernsheim, Helmut and Alison. L.J.M. Daguerre: The History of the Diorama and the Daguerreotype (New York: Dover Publications, Inc.,1968. Second revised edition) p.132.